Going out to eat is just too much of a risk for people with severe soy allergies or anaphylaxis to peanuts, so I have a tendency of throwing together some really strange (albeit tasty) meals. I get most of my stuff from Costco or Whole Foods, but buy some stuff online as well. The following three meals are definitely a bit strange, because they are definitely influenced by my Asian background and growing up in a Filipino family. 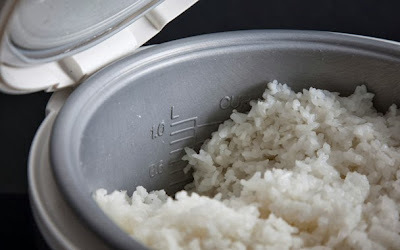 We've had a rice cooker in my house for as long as I can remember, so jasmine rice is always ready to go and throw together with anything you can imagine...hence why I eat it with practically everything. 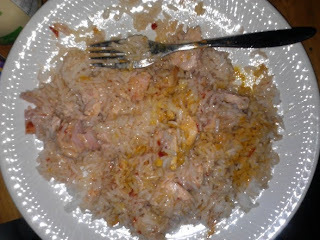 A- Wild Planet Tuna from a can along with white jasmine rice, two tablespoons of Briggs apple cider vinegar, a tiny bit of chili paste, a sprinkling of Organic turmeric (to reduce inflammation) two tablespoons of Organic Extra-Virgin Coconut oil (to help soften my skin and keep my brain from being too woozy), Coconut Secret Coconut Aminos and celtic sea salt (salt is a natural antihistamine) on top. You can also squeeze a bit of fresh lemon juice on top. Of course, if you're allergic to touching citrus and certain foods like I am, use a paper towel or gloves to hold the lemon when you squeeze. B - USDA Certified Organic Eggs (USDA Organic eggs are less likely to be soy-fed) fried in two TBS of the Extra-Virgin Organic Coconut Oil with jasmine white rice (I eat jasmine rice with practically everything--can you tell). I also sprinkle Organic Cayenne Pepper, ground black pepper (which helps your body absorb the turmeric), turmeric on top, celtic sea salt and two tablespoons of Briggs Organic Apple Cider Vinegar which makes the whole thing taste like I put my favorite Baron's West Indian hot sauce on it (which is why I do the same thing with tuna, above), which I'm currently out of at the moment. 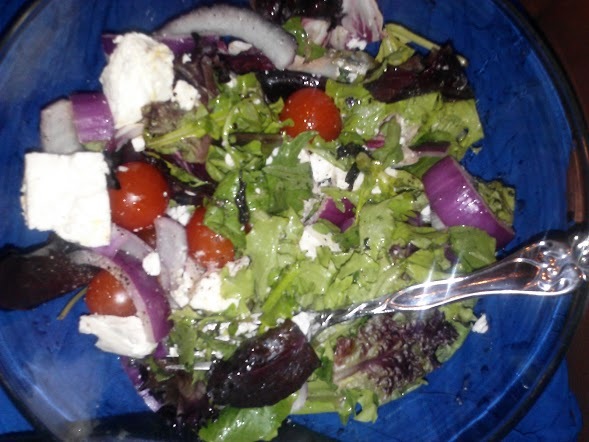 C - My own version of a giant greek salad which I eat as lunch or dinner: Organic Spring Mix from Costco topped with feta cheese, USDA Organic baby tomatoes, sliced red onions, feta cheese (I get the one imported from Greece from Costco--it comes in a delicious block soaked in brine), a sprinkling of ground black pepper, a pinch of celtic sea salt, a small pour of USDA Organic Extra-Virgin Olive Oil (MAKE SURE IT IS USDA Organic or on the list I speak of in this post--otherwise, it likely contains soybean oil! )and a few sprinkles of USDA Organic Red Wine Vinegar (not too much!). I eat with toasted gluten-free soy-free Canyon Bakehouse Rosemary & Thyme Focaccia which I buy frozen and simply defrost by leaving it out a few hours--then once I've grabbed my portion, I throw it in the fridge and it keeps for more than a few days! I basically eat these three meals interchangeably ALL THE TIME. I honestly find it hard to get sick of the salad and focaccia...and in between I usually do smoothies or snacks. Of course, you can tweak these to your taste preference but I find them to be the most healing during a bad allergic reaction. I am also including the following links to specific Pinterest boards for all the food and recipe ideas you've ever dreamed of! I'm always adding to the boards so please make sure to 'follow' them so you are in the know!